This lady’s desire was to close the spaces between her teeth, and make them look nicer. Many choices exist for this, and we selected porcelain veneers, to achieve the goal conservatively. 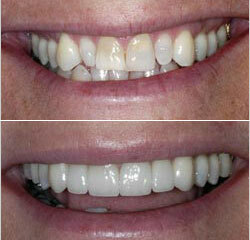 After the design and her approval, the teeth were gently shaped and the porcelain attached on a subsequent appointment. After taking care of some of her other needs, this wonderful woman one day asked us to “do my teeth.” Her teeth varied in size and positions, and after first designing the newly proposed smile, we were able to make porcelain veneers for the six upper front teeth. I have taken care of this young professional woman since she was a student at the university. She returned to our office requesting that we be the office that did the appearance change for her. With short displayed teeth, and an excessibly visible gum line showing, we had the gum line raised by a periodontist, after which we did a combination of bonding and porcelain veneers to close the spaces proportionately. A picture perfect smile ... but it’s the skill of the artist that makes the difference between a masterpiece and a total disaster. Creating beautiful porcelain veneers, which are thin porcelain tooth coverings, should be a successful blend of science and art. This includes not only how they look, but also how successfully they solve such problems as chips, cracks, discoloration, rotated teeth, and enamel wear with lasting results. Dr. Wissinger’s decades of experience coupled with his pursuit of on-going education and training are what make her a true master in the art of cosmetic dentistry. Because of the extensive available library of the doctor’s fabulous finished handiwork, we can pick before and after pictures of a case similar to yours that will help you visualize how veneers can improve your smile. Working together, we will design your new smile. Your choices of color, texture, and style will make it look very personal, natural, and unique to you. Then extensive, high-quality 35mm digital camera photography is done to establish different views of size, tooth color, shape, and amount of gum display. So before treatment has begun, we have a 3D model of your teeth; then we create a wax form of the proposed size, shapes, and position of each tooth. There are certain cases where we can use molds and tooth-colored materials for a pre-treatment visualization, so you can get an idea of what your new teeth will look like before committing to final treatment. A masterpiece is the work of a master. Entrust your new smile only to a skilled master by calling E Dental Solutions, the office of Dr. Elahe Wissinger for a consultation.